/ Programmers Jobs. Eligible applicants can apply offline for Lecturers / Programmers Vacancies. For these jobs you can apply on before 30-03-2019. Interested applicants can download the application form the official website www.bhavansvc.org. 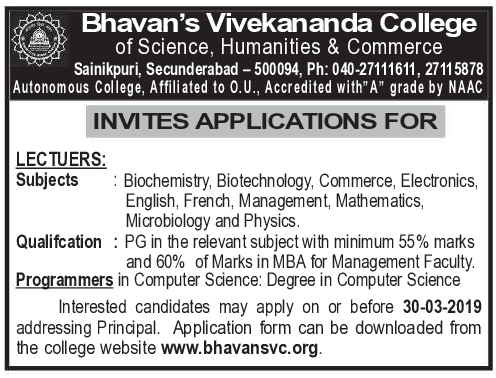 For more details refer the official website www.bhavansvc.org for Bhavan's Vivekananda College of Science Humanities and Commerce Lecturers / Programmers Jobs. Required Details like Salary, Important dates, Selection Process, Qualification are given below. 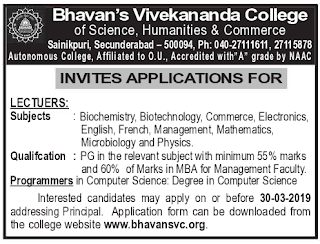 Lecturers / Programmers Jobs in Bhavan's Vivekananda College of Science Humanities and Commerce . Bhavan's Vivekananda College of Science Humanities and Commerce, Secunderabad. Starting Date to apply for Lecturers / Programmers jobs: 19-03-2019. Ending Date to apply for Lecturers / Programmers jobs: Before on or 30-03-2019. Interested candidates can download the application form the official website www.bhavansvc.org. Fill all the information and send it to the below given address before the closing date.